Two juvenile Panther Chameleons face off in a dominance display. There has been a buzz in the chameleon community ever since a study was published in December of 2013 on the effects of socialization on baby veiled chameleons. The study was meant to show that there were behavior changes as a result of social interaction. This provides another step towards the scientific community more fully recognizing a complex social system in what have been considered “lower” vertebrates. The media reporting and simplification have been misleading in describing the practical conclusions of this test. To determine the meaning of this study for our husbandry I purchased this study and in this post I discuss what they did, what it means, and what we should do with the results. Note: This study worked with the Veiled Chameleon (Chamaeleo calyptratus). The images in this blog post are of Panther Chameleons (Furcifer pardalis). Introduction. 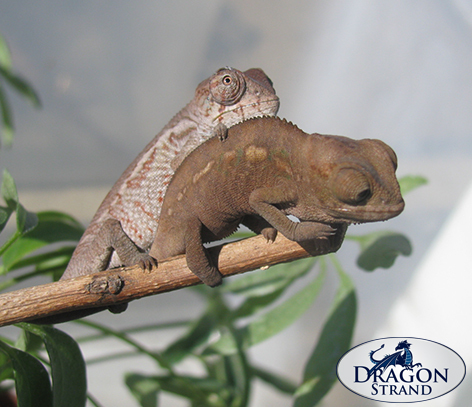 In December of 2013 a study entitled “Effects of early social isolation on the behavior and performance of juvenile lizards, Chameleo calyptratus” was published by Cissy Ballen, Richard Shine, and Mats Olsson. The goal was to test whether the behavior of juvenile chameleons could be affected by interaction with their peers. The results showed that, indeed, juvenile veiled chameleon behavior was affected by social interaction with other veiled chameleons. Setting up the Study. The researchers created two test groups from a clutch of veiled chameleon hatchlings. One part of the clutch was raised individually and one part was raised in groups of four. They tested foraging behavior and reactions to coming face to face with equivalent sized siblings at 2 months old. They found that chameleons raised in isolation had a less aggressive foraging behavior and were more likely to end up the submissive individual when presented with another chameleon. The authors went on to encourage those involved with captive husbandry to take these findings into account and to consider whether social interaction should be included in captive environments. Foraging Test. Chameleons from the isolated group and the community group were placed alone in an area, allowed to settle in, and then measured how soon they ate an introduced cricket. Result Summary: The isolated individuals took longer to eat their cricket. The authors concluded that isolated individuals had a less developed foraging behavior. Dominance Test. A chameleon raised individually is placed within visual range of a group raised chameleon and it is measured which one emerges dominant. Result Summary: The group raised chameleons were the winners in the dominance contest. The study noted that during the dominance display that chameleons from both test groups showed aggression towards each other, but the individual raised chameleon showed more submissive behaviors. It should be noted that during the test the researchers measured the display and ended the test if the subjects took it to the next level of physical fighting. Foraging ability. The researchers concluded that the chameleons that showed the decreased sense of urgency in feeding had a less desirable behavior. This bias can be seen in words such as “performed less well in foraging” instead of “displayed a less aggressive feeding response”. Since the study concludes by suggesting their findings have implications on captive husbandry situations, we need to look at the benefit scale through the lens of the chameleon surviving in the captive environment. While an aggressive foraging response (quick to hunt) is critical in wild populations, it is not critical in captive individually raised individuals. In fact, it can be detrimental. In the wild, being the first to get the food may easily be the difference between life and death. This is an especially valuable character trait when the chameleon does not know when the next meal will be available. It doesn’t matter if you are hungry or full, get those calories! Tomorrow you may get nothing. Let’s step over to the captive environment. Food is plentiful and often available every day with the keeper wringing their hands in worry if they miss a day’s feeding. Imagine the chameleon raised from a baby with plentiful food and no competition. When will that baby eat? When it is hungry. That is the feeding response learned when in the lap of plenty. It is also the condition that breeders typically keep their breeding stock because females that are well fed and comfortable will produce the largest clutches. (This is generally accepted in the breeding community, but still anecdotal as I am not aware of a scientific article on this.) What happens when we put a chameleon that is survival programmed to eat anytime it sees something move together with plentiful food? You will get a chameleon that over eats to plan for hard times, which will never come. We see this often in Veiled Chameleons, which typically have an exceptionally strong feeding response (evolving in a hostile environment will do that to you). They can have problems with obesity because their eating “off” switch is when they are so stuffed they can’t fit any more in. Living this lifestyle every day will cause a host of health issues just as it does in humans. In this light, I would suggest that it is actually better for captive husbandry that the chameleon eating response be driven by hunger instead of by competition. The study’s use of the words “strong” feeding response would more accurately be termed “competitive” feeding response as it is bringing into play psychology beyond immediate hunger into the picture. The keeper who desires to cultivate a strong/competitive feeding response in their chameleons must ask what purpose it holds. The desire for the chameleon to eat whenever you present food means the chameleon is eating on your schedule. Once again, the chameleon is being trained to eat for a reason other than hunger. This is an undesirable goal of husbandry and it should not be labeled as a benefit. Note: I am in no way advocating having food available at all times to a chameleon. A healthy feeding schedule allows the chameleon to get hungry between feedings. This properly allows hunger to be the motivator for eating. Too much food continuously offered creates a lazy, bored, and unhealthy chameleon. The Bottom Line: Your captive chameleons, whether group raised or individually raised, will have an eating response more than adequate for healthy growth. I would be interested in the growth patterns seen in these test cases over the first four months of life. There are reports (and my personal experience) in the hobbyist community that individually raised chameleons grow quicker. This is logical as neither the chameleon’s food intake nor calories expended due to stress are negatively affected by competition. As far as us and our captive environments, over eating and the keeper offering too much food are of much more concern to our chameleons’ well being than a casual feeding response. Dominance. The results of this part of the test are not surprising. Put a chameleon that has had to fight for his place in the pecking order every day in with a chameleon that has never experienced a fight and we have the equivalent of putting a boxer and a water color artist in the ring together. Once again, the question we must ask is what benefit this behavior has in the captive environment. Does the lack of a strong dominance behavior harm the captive chameleon later in life? Are we failing to develop a behavior that allows the chameleon to more fully be what a chameleon “should” be? The answers to these questions are up for debate, but generally the answer is no. There are two cases I can think of where this might be relevant. 1) Do the skills developed with early interaction with other chameleons affect, positively or negatively, their interaction with their humans? This is a stretch, but we never know until we look to see if it exists. 2) Does early social interaction increase the effectiveness of future breeding attempts? A male must certainly be aggressive to convince the female to allow a mating. It is easy to show that chameleons raised individually are able to mate just fine (repeatable personal experience), but can even rudimentary experience in the dominance battle stack the cards further in the male’s favor? It is worth further study as to how winning or losing the dominance contest affects ability to mate in the future for both males and females. For example, I have a group raised female Panther Chameleon that is exceedingly bad tempered and will aggressively attack any male that seeks to mate with her. I wonder if she was the dominant member in her group. The study of how social interaction as juveniles molds the behaviors that affect breeding in both genders would be a welcome one. But let’s get back to the results of this particular study. The final note I would like to make is that in every run of the dominance test, the scientists recorded the results of when one determined dominance. That should raise a red flag for us captive care takers. In each and every case of meeting another chameleon there was aggression and there was a dominant one and there was a submissive one. A winner and a loser. There was no test case where the two test subjects walked over, sat next to each other, and shared a cricket. There was always a pecking order. Pecking orders mean stress not only for the submissive ones, but also for the dominate ones who have to continually establish their position. Let the implications of that sink in the next time we say that babies can be housed together up to three months old. While the physical posturing will subside after the battle is won, the pecking order is still actively maintained on a daily basis. A pecking order means the top gets the better resources sooner and longer. The Bottom Line: Until an advantage to developing dominance skills becomes necessary in your captive environment, don’t purposefully create the situation. Color Pallet. There is one comment that has sparked ample attention in the community. The researchers noted that in the dominance display the group reared chameleons “also exhibited a higher chroma… and were brighter” during the aggression. This statement has been erroneously construed to say that group raised animals would show a wider, brighter pallet of colors as adults. While effects on adult coloration can be speculated, there is nothing in this study that addresses color pallet range. It merely observed what shade of green or brown was displayed in a 2 month old chameleon in its first show down. It is just as valid of a theory that the inexperienced chameleon was shell shocked from having this gaping, hissing, aggressive thing in front of it and started scared. I wonder what would happen if you put the loser in with a smaller chameleon so it could be the victor. Would the bright colors come through? Further study must be made before we can say that color pallet is learned from others or that competition as juveniles has any affect on color range as adults. Whether there is a connection or not, this study offered no evidence of it or even established that there is a group of adult chameleons out there that do not know, or cannot access, the full range of their color pallet. While we are making our wish list of studies, let’s find out if chameleons control the color by their brain or if the brain controls the emotions and the body produces color to match according to biological make up. One would be affected by experiences and learning while the other not. As far as color pallet goes, there are some important pieces to this puzzle we need before we can see the true picture and come to conclusions. The Bottom Line: As with each of these points, much of the confusion comes from how the study was portrayed in the media reports. If you are interested in how adult color pallet may be affected by experiences as a juvenile consider setting up a test of your own to get the conversation started based on reproducible data. The result of a dominance contest among group raised panther chameleons. The victor is brightly colored and crawling on top of the submissive one. I believe the value of this study was that it showed that chameleons have a more complex behavior than they were previously given credit. This is important because being aware of the possibility of higher function opens to door for us to exploring those characteristics. This study provides part of the foundation to prove these behavior developments exist. Even if we, as long time chameleon keepers, say these test results were obvious and unsurprising, it is critically important that these concepts be proven in a scientific manner, such as this study, to lay an objective and repeatable foundation to build our knowledge upon. In reading this study, remember that the value of the tested behaviors to the captive environment was not addressed. The researchers in this study created stress situations and measured the response. An urgency around food or the display contest are not (or should not be) relevant in a proper captive husbandry condition. The measurement scale in this study appears to be geared towards life in the wild. The calmer approach to feeding was described as “performed less well”. It was then referred to as an impairment. Performing better in dominance display was considered a “benefit”. The researchers seemed to have maintained the assumption that being prepared for a life of competition and conflict is a benefit. In the wild there is little doubt this is the case. Unless the animal in question is going to live a life of competition and potential conflict in captivity we must, once again, view the results as to how they are relevant to captive conditions. Private keepers have no reason to induce stress reactions (such as food competition and dominance play) and to do so with no other end benefit would be poor husbandry. The ability to for a chameleon to develop a response is no evidence that the response is beneficial or necessary in a captive environment. Our captive kept chameleons face a different life than their wild cousins. Regardless of how we try to replicate a chameleon’s environment we are still keeping them in an environment foreign to where they have evolved. The captive world is a world entirely different. This is said without judgment towards positive or negative. For the restriction of movement we give a parasite free life. For having to live with big monkeys, the big monkeys bring them food on a regular basis. For every negative we strive to substitute more positives in an attempt to create a net positive. Regardless of how we stack the scale towards the positive, though, it is still a much different place than the wild and requires different life skills. In other words, captivity changes what is necessary and important in chameleon behavior. It means that some behaviors crucial to survival as a wild chameleon are no longer necessary as a captive chameleon pet. Where before an important skill was to eat whenever they could, now the problem is avoiding obesity. Where before they were on guard to defend their territory against invading chameleons, now they must develop social skills with humans trying to handle them. Final Note: Does this study support cohabitation? This study does not make any specific recommendation as to how the results should be used to modify captive husbandry beyond suggesting that a higher cognitive capability be taken into account. The study merely shows that there are behavior modifications done by social interaction. The aggression the members of this study showed each other should actually be a warning against raising chameleons up together. If a behavior necessitating social interaction is identified then a method safer than cohabitation can be used. Closely monitored “play dates” and/or sessions with a mirror can exercise dominance play without danger of physical damage. The dangers of cohabitation are well known. Slower growth rates, physical damage, and nipped tails from bites are common. One only need go to the forums and reptile shows to see captive bred “B” grade animals. This is from raising babies up together. There is no shortage of stories of one animal in a cohabitation situation that slowly withers away over a long period of time. These damaging and deadly situations must be addressed in some manner before any change in husbandry to a more social situation is advised. I have yet to see harm to a chameleon raised without chameleon social interaction, but I have seen plenty of harm to chameleons raised or housed in pairs or groups. To conclude, this is not to say that chameleons cannot survive or even thrive with other chameleons around. There are methods of husbandry which allow cohabitation that fall within many chameleons’ adaptive range, but they are only successful with one critical ingredient. – freedom to escape. If cohabitation is of interest, the topic is explored, with its dangers and that one critical ingredient for success, in the blog post “Keeping Chameleons Together”.